All patients that underwent laparoscopic or robotic colectomy. Patients that underwent emergent surgery and patients that were diagnosed with pre-operative sepsis were excluded. 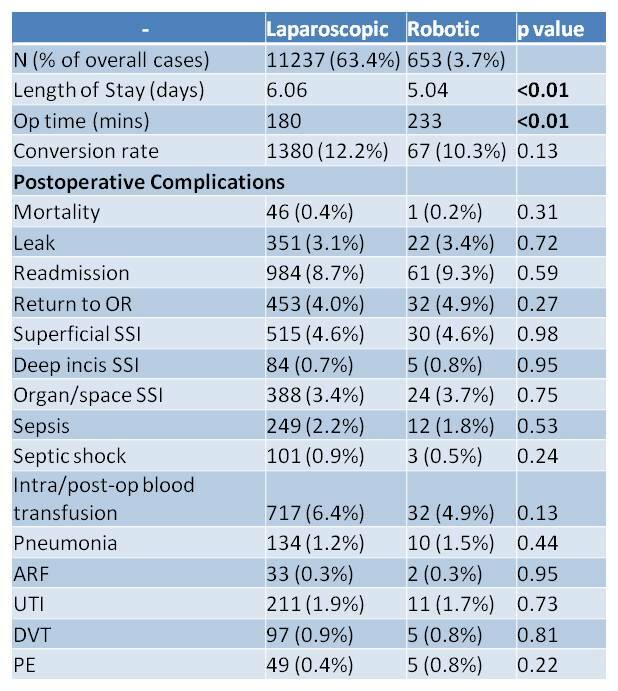 Length of stay, operative time, postoperative complications (within 30 days). Of the 17,774 colectomies included during the study period, 11,237 (63.4%) were LC and 653 (3.7%) were RCs. In comparison with LC, RC was associated with increased operative time (233 vs 180 mins; p<0.01) and decreased length of stay (5.04 vs 6.06 days; p<0.01). There was no significant difference with respect to mortality rate (0.2% vs 0.4%; p<0.312), anastomotic leak (3.4% vs 3.1%, p = 0.715), reoperation (4.9% vs 4.0%, p = 0.27), conversion rate (10.3% vs 12.2%, p=0.13), or readmission (9.3% vs 8.7%, p=0.593). In this head-to-head comparison of laparoscopic colectomy and robotic colectomy, the majority of postoperative outcomes were equivalent except for an increase in operative time and shorter length of stay in the robotic group. Robotic colectomy appears to be a safe option for minimally invasive colectomy but further studies are needed to elucidate whether it is cost-effective when compared to laparoscopic colectomy.